Arsenal keeper Vito Mannone has re-joined Championship club Hull City on loan until the end of the season. The 22-year-old Italian recently returned to his parent club after suffering a thigh injury in Hull's 1-1 draw with Reading on 28 January. He has since returned to the KC Stadium but is not expected to be fit until early to mid-February. Mannone's loan replacement Brad Guzan is unlikely to play against Wigan as Aston Villa do not want him cup-tied. 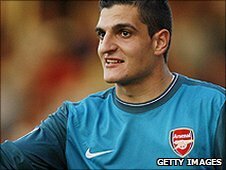 Mannone, who has won seven caps for Italy's under-21 side, signed a new contract with the Gunners earlier this year but has been unable to establish himself as a regular in the side ahead of Manuel Almunia and Lukasz Fabianski.